as a boy in oklahoma, [im an ol man now] i walked fields of hemp..it was all around. 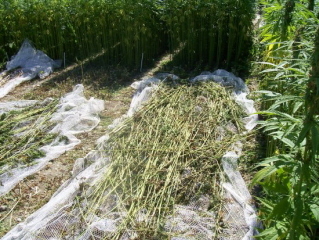 It is a good crop, it has soo many uses, we may NEED it someday soon if we run out of fuel. I hope them the best in the courts. It is wrong to outlaw hemp, and millions of people know it. The prohibition of Cannabis is an abomination. Google "white men's shadows", Google anslinger+jazz+swing. From the unmatched nutritional value of hemp seed to the unmatched efficacy of medicinal bud, Cannabis prohibition is a crime against humanity; it is tyranny. Noted hemp farmers Jefferson and Washington would slap the DEAthugs' faces. God gave man "the green herb" twice in the 6 days of creation: Two more times God mentions giving “the green herb” to man in Genesis. "The Green Herb" is again given by God to Noah after Noah survives the Flood. The green herb was the only thing Noah did not take enough of on his ark. The animals ate too much and the birds got into the seed. But God made sure there would be plenty of Green Herb after the Flood and states so in the Bible. The DEA’s own Federal Law Judge Francis Young in 1987 ruled "marijuana to be the safest known medical pathway to the brain" and the Feds have been in fear ever since. The 'Green Herb' is the only key that unlocks the THC door to perception, the one that lifts the veil of deception and shines light on truth. The Cannabis plant is the only plant or herb that is completely green, including its flower. Think about it. How many green flowers can you associate with any other plant than the "Green Herb"? There is only one green herb on the planet and it is cannabis for mind, body and soul. Noah was a master of 'vineyards' and knew how to make wine. He got drunk on his grandson's wedding night and did the dirty with his grand-daughter. Alcohol rules from the Flood to the End. PS. do an internet search for bible concordance and look up "green herb" to find all the occurrences of green herb mentioned in the bible. Use the concordance to look up all kinds of words in the bible. Only when you find all the different places and uses can you figure out what is really going on. This is all more smoke...legal hemp, pot for patients, all these things set the marijuana decrim effort back 30 years. We should instead pool all our resources (if indeed many of these anti-prohibition web sites REALLY want the stuff legalized...) and argue for decrim based on the Constitution and go the way of alcohol during that Prohibition. They cannot prove the stuff harmful, and when you challenge them on those grounds, along with the RIGHT TO BE SECURE IN OUR PERSONS AND EFFECTS, we stand a much better chance of winning in court. Prohibition destroys the fabric of American society by stimulating street crime and punishing people for committing no crime against anyone or anyone's property. This is our argument.